A loan of $1,450 helped a member to pay for plowing, farm inputs, tools, and seeds. 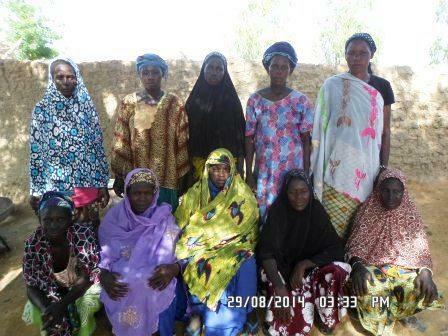 The ten members of the group “BENKADI 4” are married women, who average 30 years of age and two children each, all living in traditional families in GUELEKORO, a village in Commune de SAN, Cercle de SAN (4th administrative region of the Republic of Mali). The women are collaborating with the microfinance institution Soro Yiriwaso to carry out their farm work during the rainy season. They are on their fifth loan with the institution. The past loans were indeed paid back. The crops grown are rice and peanuts, as is the case with BAH (the woman sitting second from the left in the photo). With her loan, she intends to purchase farm inputs, seeds, and tools and to pay for plowing to maintain: 2 hectares. After harvest, the produce is sold to men and women customers in the village and in SAN. She plans on making an average profit of 32,000 francs CFA at the end of the planting season. This profit will enable her to pay back her loan and also to help out her husband in covering day-to-day expenses. Les 10 membres du groupe BENKADI 4 sont des femmes mariées ayant une moyenne d’âge de 30 ans, 2 enfants et vivant toutes dans des familles traditionnelles à GUELEKORO, un des villages de la commune de SAN cercle de SAN de la 4ème région administrative du Mali. Elles collaborent avec l’institution de microfinance Soro Yiriwaso afin de mener à bien leurs activités agricoles pendant l’hivernage. Elles sont à leur 5ème prêt avec l’institution, les prêts passés ont été bien remboursés. La spéculation cultivée est : le riz et l’arachide avec BAH, 2ème femme debout de la gauche vers la droite sur la photo. Avec son prêt, elle compte acheter des intrants, des semences, des petits matériels agricoles et payer les frais de labour pour entretenir : 2 hectares. La production sera vendue au niveau du village et à SAN, après la récolte, à une clientèle composée d’hommes et de femmes. Elle compte réaliser un bénéfice moyen de 32 000FCFA en fin de campagne. Ce bénéfice lui permettra de payer son prêt et aussi d’aider son mari dans les dépenses quotidiennes. Soro Yiriwaso is a microfinance institution that works primarily in rural and semi-urban areas of Mali to provide underprivileged communities with access to financial services.The organization facilitates access for disadvantaged clients, particularly women, to new resources and services, fostering solidarity and cooperation among its clients. Kiva lenders’ funds will enable Soro Yiriwaso to expand its outreach and target even more underserved Malians involved in business and agriculture. Soro Yiriwaso works in rural areas with groups of women bound by solidarity guarantees.The organization follows respectful procedures integrated with local social structures. Kiva is thrilled to be working with an organization that relies on these values to serve the ultra poor while growing in other areas like health insurance and savings.